An interesting paper on Arxiv caught my eye the other day. 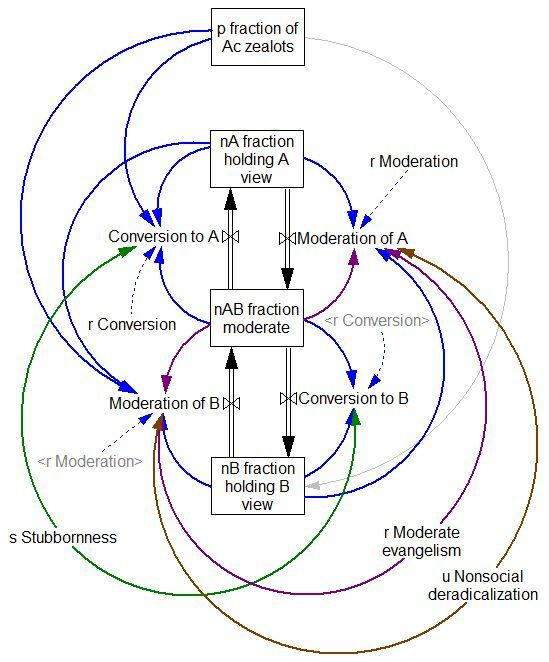 It uses a simple model of a bipolar debate to explore policies that encourage moderation. Some of the most pivotal moments in intellectual history occur when a new ideology sweeps through a society, supplanting an established system of beliefs in a rapid revolution of thought. Yet in many cases the new ideology is as extreme as the old. Why is it then that moderate positions so rarely prevail? 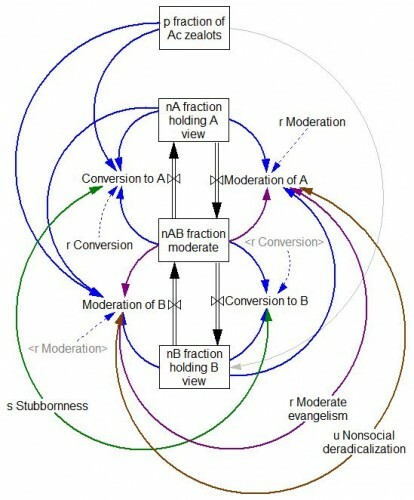 Here, in the context of a simple model of opinion spreading, we test seven plausible strategies for deradicalizing a society and find that only one of them significantly expands the moderate subpopulation without risking its extinction in the process. This is a very simple and stylized model, but in the best tradition of model-based theorizing, it yields provocative counter-intuitive results and raises lots of interesting questions. Technology Review’s Arxiv Blog has a nice qualitative take on the work. The model runs in discrete time, but I’ve added implicit rate constants for dimensional consistency in continuous time. These should be runnable with any Vensim version. If you add the asymmetric generalizations in the paper’s Supplemental Material, add your name to the model diagram, forward a copy back to me, and I’ll post the update. The following models are replicated from Steven Strogatz’ excellent text, Nonlinear Dynamics and Chaos. These are just a few of the many models in the text. 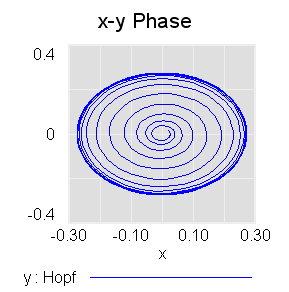 They illustrate bifurcations in one-dimensional systems (saddle node, transcritical, pitchfork) and one two-dimensional system (Hopf). The pitchfork bifurcation is closely related to the cusp catastrophe in the climate model recently posted. These are in support of an upcoming post on bifurcations and tipping points, so I won’t say more at the moment. I encourage you to read the book. If you replicate more of the models in it, I’d love to have copies here. These are systems in normal form and therefore dimensionless and lacking in physical interpretation, though they certainly crop up in many real-world systems.